For those who are looking for an alternative to in office teeth bleaching process, then at Ivory dental clinic we provide at home tooth whitening kits that enable you to perform do-it-yourself at-home whitening at your convenience. The at home tooth whitening kits are pre-mixed and ready to use at home. They produce effective results and an instant visible whither and brighter teeth. However, it is recommended to consult a dentist before trying the at home teeth whitening kit to produce effective results and to rule out the possibility of any underlying gum or teeth conditions. If there is any condition of tooth decay or gum diseases, it can cause extreme pain and discomfort after the application of teeth bleaching agent. Long-term results: At home teeth whitening results are long standing and can be repeated regularly for several months. Variety: Numerous at home teeth whitening kits are available including whitening trays, strips or paint-on products that can be used at your convenience. Convenience: Can be used at any time of the day for short or extended periods. Portability: have the convenience of carrying a teeth whitening strips while on the go. Cost: Affordable with instant and long lasting results. 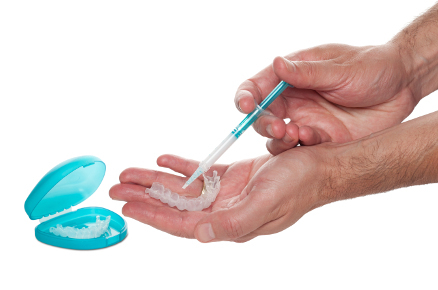 However, there are few cons for regular use of at home teeth whitening agent. Overusing them or using them incorrectly can harm the tooth surface and may irritate the gum tissue or uneven results. To ensure the safety of at home whitening kits it is recommended to visit a dentist before choosing a tooth whitener and starting the bleaching process. Dentist-Dispensed Take-Home Whitening Trays: These are the best at home bleaching trays that produce instant results and suggested for particularly those that are over extended periods. The kits contain custom-fitted application trays to ensure that the bleach stays in contact with the teeth, for maximum result. The bleaching agents are re-loaded into the trays and require adding a desensitizing agent before or after application. At Ivory dental clinic, we craft tray based bleaching system that can be purchased at low costs. Whitening Strips: whitening strips are thin flexible membranes with a bleaching gel designed to match to the shape of the teeth. They are very convenient and easy to use. Apply once or twice a day for 10 to 14 days depending on the severity of stain present on the teeth surface. Whitening gels and strips are available at reasonable costs from our centre. Brush-On Whiteners: these are fuss-free instant whitening pens with brush-on or foam-tip applicators for instant whitening. Toothpaste: Toothpaste with high dose of whitening agent is recommended for mild stains. They contain polishing agents that help cleanse the stains from teeth. Floss: Whitening floss assist with stain removal in the narrow space between the teeth. To know more about at home tooth whitening kits and to choose the best suitable teeth whitening method and the treatment cost, book an appointment now.